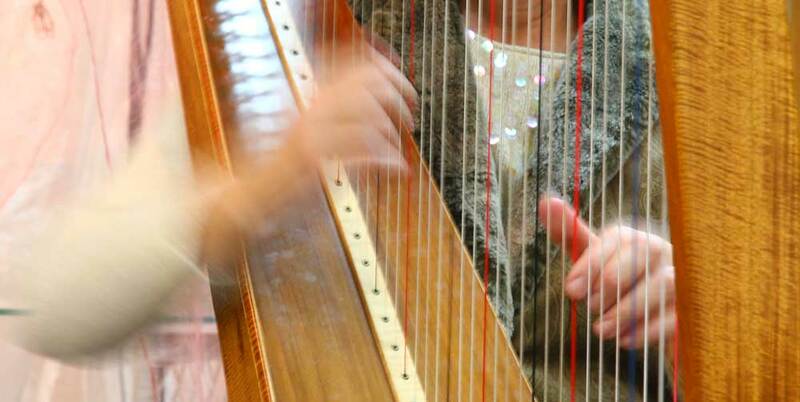 Bringing the beauty of the harp to special events for over 25 years. Rebecca Hilary Smith has been a professional harpist and teacher for over 25 years, bringing warmth and experience to all her musical endeavors. A Central Oregon native, her education and travels have enlivened her repertoire with music of many different times and places. Beyond her solo performances at regional special events, Rebecca produces and performs in collaborative concerts in Sisters and the Willamette Valley throughout the year. She is a long-time teacher at The Cascade School of Music and teaches private harp lessons in her Sisters, Oregon studio. Her music brought peaceful beauty to our wedding. Plus, it was such a relief to have a calm, capable person in the midst of all the commotion! Becky was easy to work with and her years of performing music for weddings was obvious. She had many tips and tricks for making things go smoothly, beyond even the ceremony music. It was a real bonus for us. I recommend Miss Becky to all my friends that need a music teacher. She encourages me to work harder and stronger out of my love and devotion to her as a person. It seems like I am able to accomplish so much in a little time. Rebecca Smith is one of the best mentors I’ve ever had. I’ve studied with several teachers and always come back to her. Her encouragement throughout the whole process of being a student musician is priceless. I play both the pedal harp and lever harp, and can easily adapt to a variety of situations, indoors and out. I can also organize duets & ensembles if your event needs more than one musician. I’ve played for nearly one thousand weddings in addition to many other events, and am happy to share from my wealth of experience to help you make your special occasion a success. I have been teaching harp specifically and music generally to all ages through private lessons and in classroom settings for over 25 years. I teach many styles of harp and often have harps available for rental. I am also available for workshops, and cover many popular topics for all levels. Hawaiian music for Solo Harp. Kolea is an album of songs that have become favorites of her fans in Hawaii and on the mainland. Cascade School of Music in Bend, Oregon. You can listen to samples and buy the album online at CD Baby.